The sky is dark and overcast this morning....the weather forecast predicted rain all day and it looks like it was right. Being a "fair weather traveler", bad weather on vacation makes me grumpy. But we are able to eat our breakfast (from the very extensive buffet) on the covered terrace overlooking the pool, which is very pleasant. 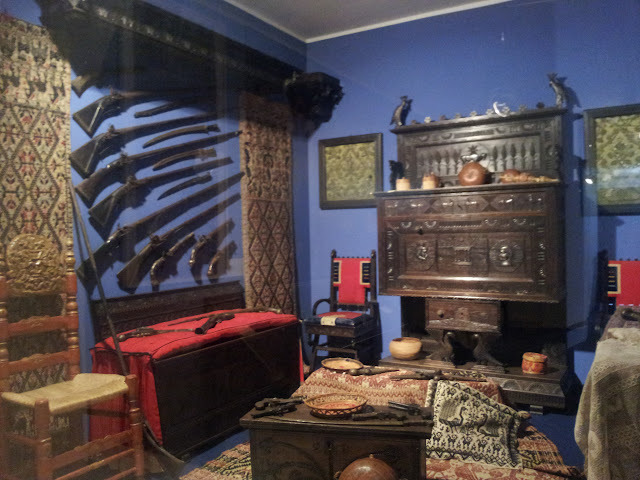 There are some interesting museums in the area so we plan to use the rainy morning to visit them and then hope for the best. The rain starts falling as we drive to Nuoro, the provincial capital and sometimes called "the Athens of Sardinia"--some of Sardinia's most famous authors and artists are from the area. 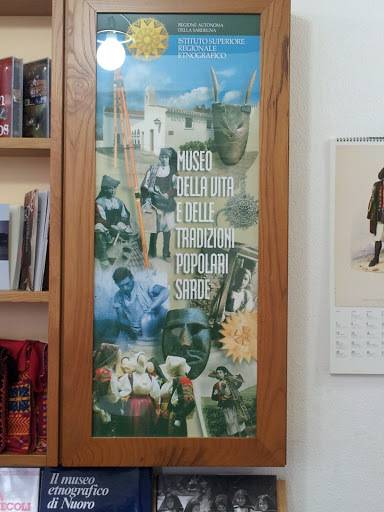 We get to Nuoro easily and begin the steep climb into the centro and above, to our first destination--the Museum of Popular Life and Tradition. Happily there is a parking lot in front of the building. 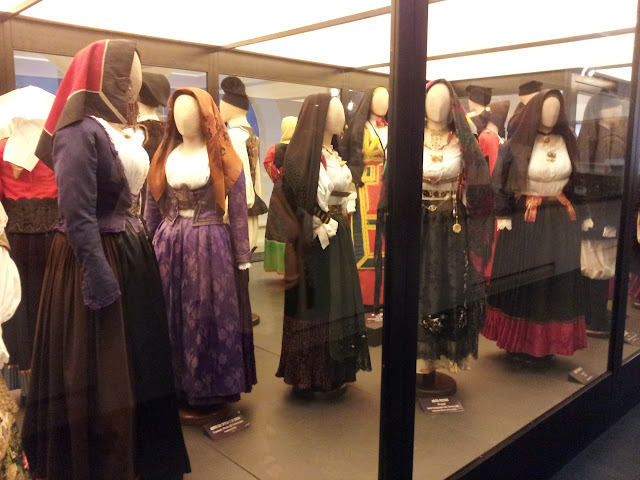 The collection of Sardinian folk costumes and crafts is very imaginatively displayed. 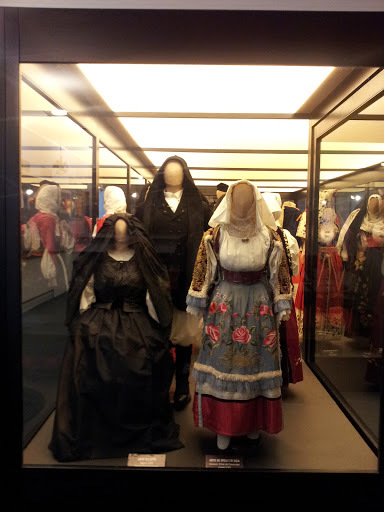 The costumes are dressed on mannequins in a large display case in the middle of the room...there are over 100 examples, many of which we had seen in the Sant'Efisio procession in Cagliari. Each town boasts distinctive festive and wedding attire. 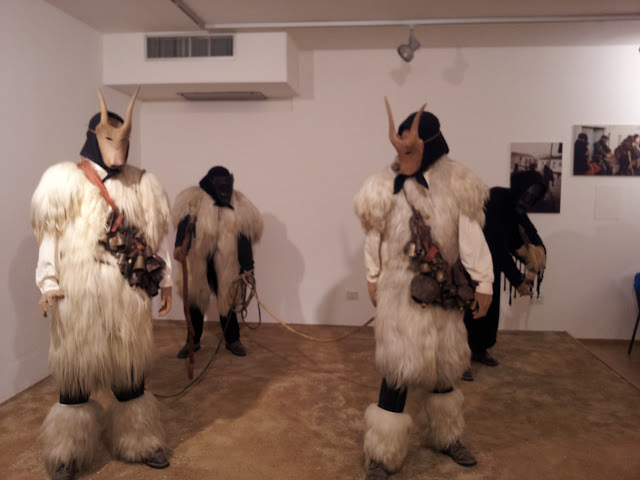 Particularly stunning are the recreations of the masked figures from festivals that take place around the island. 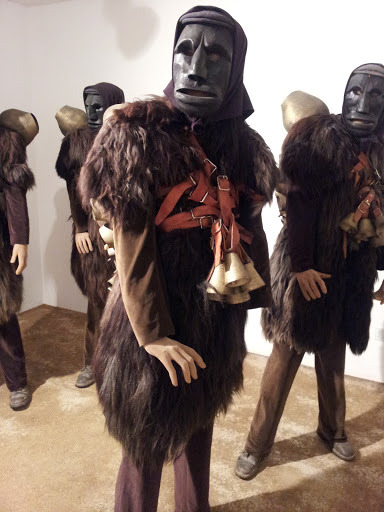 Some of them are very menacing. 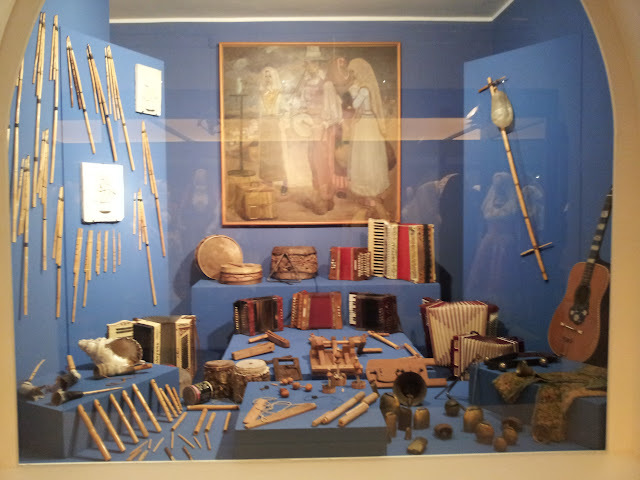 Along with the displays there are many photographs of festivals from earlier years which gives the displays a richer context. Next, we want to see if any of the shops selling Sardinian crafts are open onSunday morning so we follow the GPS direction into the center of town. We also follow signs for the art museum, but streets closed for construction and the pelting rain do us in. The town, which is very steep and is filled with narrow, twisting streets, gets the better of us. We find ourselves circling around endlessly looking for addresses....and finally we decide to change plans. We escape Nouro and head east for the coast....hoping for improved weather. We think we see a brighter sky ahead of us and we are enjoying the scenery as we drive. Sardinia really is amazingly beautiful. But the rain is continuing. We stop at the beach at Orosei for a minute...it is long and sandy and stretches for miles..and then stop in town for coffee. The town is quite busy, both with locals and tour bus of Germans. Diana finds a shop that is open and makes a few purchases. 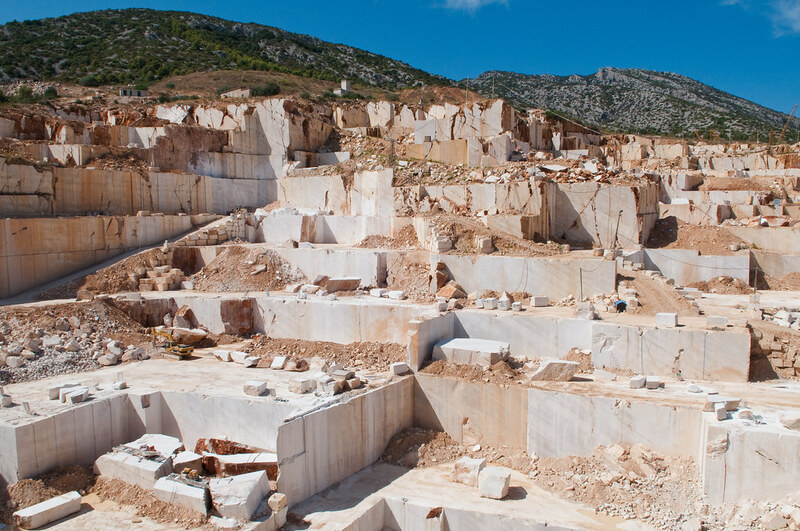 As we leave Orosei, we are surprised to pass a long stretch of marble quarries...apparently quite a big business for the town. 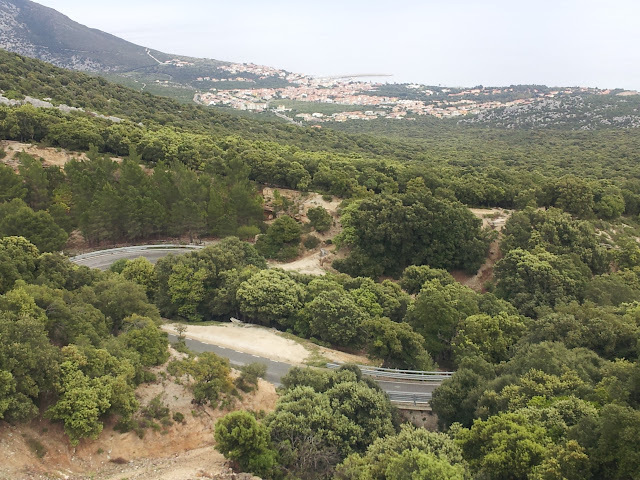 The road north towards Dorgali is even more scenic....the sea is off to our left and periodically appears as we twist around the side of the hills that come right down to the sea. The approach to the beach resort of Cala Gonone is even more dramatic. And, as we descend to the town, the rain is stopping and the sky is getting brighter. Cala Gonone is an attractive little resort town with a nice sandy beach and a stretch of restaurants and bars along a pretty waterfront park. We pick a place--Road House Blues--and are seated a table overlooking the water. Lunch is fine....and the setting and improved weather is great. We each have a pasta dish and a salad and even have a glass of wine. After lunch, we stroll along the water for a while before driving back up the mountain. Unfortunately as we head back inland, the rain starts again in earnest so we return to the hotel. We spend the afternoon resting and writing.......Diana explores the hotel looking at the displays of art and crafts and pricing some of the things she is interested in buying -very expensive. Dinner at the hotel dining room is as good as the night before....After the antipasto buffet, I have a very good Sardinian gnochetti with a wild boar sauce and Diana has a steak which she enjoys. We have the same Cannonau-Sangiovese blend as the night before. Tomorrow, better weather is predicted and we are off to the west coast of Sardinia.